You may also find bok choy referred to as pak choy, bak choi, paak choi, Chinese mustard cabbage and Chinese chard cabbage. I personally think bok choy has a much lighter taste than regular cabbage and a better texture for cooking with as well. I use it regularly in healthy stir fries and occasionally in soups and salads as well. On its own the flavor has been described as a cross between cabbage and iceberg lettuce, with a slight mustard tang to it (though only the most delicate of taste buds would find it particularly strong). In recipes, it will tend to take on the flavor of whatever it is cooked with. This, along with all the beneficial effects on your health mentioned ahead, make bok choy a great low-calorie base for many meals. 1 cup of chopped bok choy (around 170 grams) has just 20 calories and 3 grams of carbohydrates. This is so low it is considered in the negative calorie category of foods, whereby your body actually uses up more calories digesting it than are in the food itself. I wouldn’t put too much thought into the exact calories of various foods as there are a lot of other factors that are more important, but bok choy is clearly a great vegetable for weight loss. Just eating it has a natural thermogenic effect. Nutritional data ranks it as five stars for weight loss and with a glycemic load of 1 (as low as you can get). Most nutritional information for bok choy will tell you that it is extremely high in vitamin A. This isn’t strictly true. What it is really high in is antioxidant carotenoids like beta-carotene that can be converted into vitamin A if needed. If you have enough vitamin A in your diet from sources like organic eggs, or perhaps best of all, a good cod liver oil like this (which is importantly also high in complementary vitamin D), then you won’t convert these carotenoids. They will remain in their current form, circulating in your body to extinguish free radicals and prevent them from damaging cells in ways that can lead to various diseases. This is a role that is likely to be more beneficial to anyone that isn’t already low on vitamin A. That said, bok choy health benefits do include being a good source of potential vitamin A for vegans and vegetarians. Ideally have it in meals with healthy fats to aid in beta-carotene absorption. This green superfood is also a way to obtain two other valuable carotenoids – lutein and zeaxanthin. These nutrients are particularly good for protecting your eyes from damaging UV and high-intensity blue light. Having enough of them in your diet can help protect your vision now and lessen your chances of developing age-related macular degeneration and cataracts later in life. Other interesting antioxidants in bok choy include indole-3-carbinol, which is being studied for its anti-carcinogenic properties and for its ability to suppress estrogen’s negative effects. Thiocyanate, which is associated with reducing the damage caused to cells by the body’s inflammatory response, particularly in the case of diseases like cystic fibrosis and diabetes. And sulforaphane, which has been shown to be a powerful protector against cancer-causing compounds and oxidative damage within your body. Vitamin C is another powerful antioxidant in bok choy. A cup of the chopped leaves contain around 45 mg or 75% of the recommended daily allowance (though this figure is too low and it’s worth getting much more if you want to feel the beneficial effects of vitamin C on your health). Unfortunately vitamin C is easily depleted by high heat, usually over 160 degrees fahrenheit or 70 degrees celsius. For this reason I’d recommend adding it at the later stages to stir fries and other meals. It is also much better to steam these greens in a steamer that protects the nutrients than boil them, where much of the nutritional value is leached into the boiling water. Another even healthier option is to juice or blend it and bok choy added to juices and smoothies must be one of the best ways to get all of its health benefits. 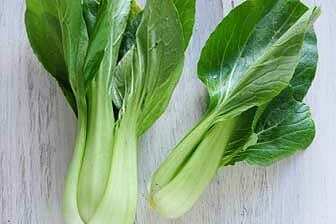 Other vitamins in bok choy include significant levels of vitamin K and a variety of B vitamins, especially folate. Vitamin K is essential for proper calcium metabolism and preventing many diseases of inflammation, such as heart disease, osteoporosis and arthritis. B vitamins are needed for proper digestion, energy production, a well functioning brain and nervous system and reducing stress, healthy skin and hair and a variety of other important functions within your body. The folate in bok choy helps to produce and maintain new cells, protecting them from DNA changes that can contribute to them turning cancerous. Folate is necessary for the production of both red and white blood cells and can have a protective effect on your heart and cardiovascular system. Alongside all the antioxidants and vitamins, this healthy vegetable usually provides a good spectrum of minerals. Calcium, iron, potassium and selenium (also an antioxidant) are most often measured as the predominant ones in terms of RDA, but the smaller amounts of other minerals are also important. I hope this page has provided enough reasons to include more of this superfood in your cooking. Despite having next to no calories, bok choy has many health benefits and is an excellent way to get a variety of vitamins, minerals and protective antioxidants into your diet. I’d really like to read your comments if you have cooked with bok choy before and have any healthy recipes based around it. Next up I’ll be covering in detail the best ways to use bok choy in your meals. I love Bok Choy and will start using it more! A must!! Beef and broccoli are a staple at our table! Steam in batches with garlic and leftovers for lunch! I’d consider this incorrect, though they may be referring to possible pesticides on greens. It’s best to wash all greens like bok choy in hot water with vinegar to remove these. I stir fry the entire leaf, washed, drain, chopped with turkey bacon, white beans, sliced carrots, quartered cherry tomatoes, with olive oil, balsamic and garlic dressing and topped with Parmesan cheese. Sooooo good. The recipe can be found on Danette May’s website. Thank you for all of the great information on one of my new favorites; Bok Choy. I prepared it for the first time last year. I am 60 years old.